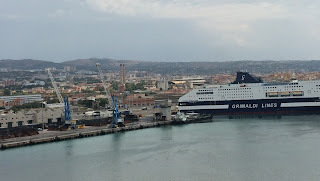 We had a very nice breakfast at our Hotel Traiano in Civitavecchia. Jet lag prevented a good night’s sleep for some of our party, but both Dan and I slept pretty well for the first night. We heard that after we retired Dirk and Tracy went back down to the sea for an evening swim. They said it was wonderful, salty and warm. I was envious! We had signed up for the 11:00 shuttle van to the port, so we all were down by 10:30 to check out and wait. The sky was threatening and we could hear thunder. Pretty soon it began to pour, with plenty of lightning and thunder. Time passed and no van came. Finally the desk clerk told us the van was delayed because of so much water at the port — he called it a lake and I was a bit confused for a moment — how could the port be on a lake? Eventually the rain stopped and the van arrived. Embarkation was quick and efficient; the lines were not long at all. We were each presented with our Seapass card, which serves as room key, credit card, and identification for getting on and off the ship. The ship is a cashless society except for the casino. As part of our deal, we have some money preloaded on the card as well as a drinks package. We headed directly to the lunch buffet, where we sat outside. It was quite warm, but there was a good breeze. Later in the afternoon it rained heavily again, just before our 5:00 departure. At 4:20 we had the required safety muster where we had to gather at our meeting point in the theater. In the past, we had to actually put on our lifejackets and go stand near the lifeboats. Now they just show a video about safety and what to do if the warning signal goes off. We met up at one of the bars for before-dinner drinks and then proceeded to the dining room. The menu has a good variety of appetizers, salads, soups, and entrees. The meat lovers at our table had prime rib, Dirk had Spaghetti Bolognese, and I had a lovely salmon. Dan and I bid the younger ones good night and went off to bed. This morning we had tea brought to our room at 6:30 and sat on our balcony to watch the sunrise. Today we will be at sea all day, giving us a chance to find our way around the ship and spend some time relaxing before sight-seeing begins. The internet on the ship is quite slow, so I'll only post one picture today. 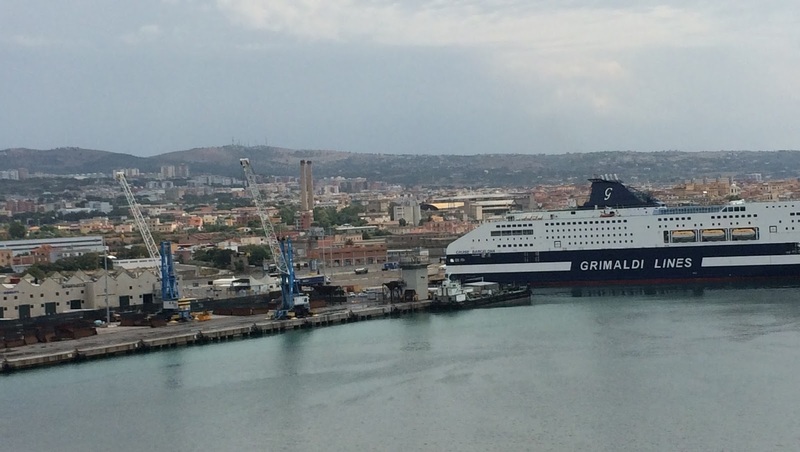 This view is looking back toward the port of Civitavecchia.